Taking care of caretakers | deister electronic UK Ltd.
Modern textile management from deister electronic ensures the efficient use of high-quality workwear for the Ulrike Caselato Care Team..
Ulrike Caselato has been providing professional outpatient and inpatient care for 20 years with her qualified specialists. Safety, trust, reliability and the highest quality are among the recognized strengths of her business. Given the continuous development and expansion of this successful company, the management of highquality service apparel has reached a complexity that requires an automated approach. A solution from the RFID specialist deister electronic now ensures perfection: a modern textile-management system that manages the daily distribution and return of workwear transparently and efficiently.. High-quality workwear is expensive – it has to be available at all times and be in perfect condition. Ulrike Caselato relies on manageable processes and controllable quality for cleaning: She prefers small, local laundries instead of well-known large service providers. But there have almost always been problems with the laundry inventory. “A certain turnover in staff is normal in our profession,” says Ulrike Caselato, “and in the past the workwear sometimes left the company with the employee. Some team members probably also washed their workwear at home, which of course is not allowed for hygienic reasons. It was nearly impossible to prevent this because the workwear could not be clearly assigned to the respective employee in organizational terms. Once a year or so I had to buy workwear again – more often than would have been expected under the normal and intended use. It was a complex and unfortunately also expensive problem,” says Ulrike Caselato with some annoyance. So the smart businesswoman decided to use fully-digital textile management from deister electronic. Intelligent laundry distribution and return cabinets from the texCabinet series were installed in two caretaking facilities. Each piece of clothing from the Caselato Care Team is now equipped with a robust UHF RFID transponder, allowing it to be assigned to the respective wearer in the laundry-management system. How does it work? 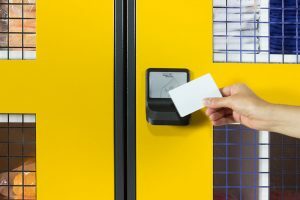 Every employee has to register with their personal contactless ID card before taking out the workwear. Then the distribution cabinet opens – and the system registers exactly what has been taken out. The return station for used workwear is also equipped with a UHF reader: Which clothing is currently being used by which employee? Which workwear is currently in the cleaning cycle? Which caregiver last wore damaged clothing? Who “hoards” or steals workwear? Has a departing employee also returned everything? Which clothing is used how often? What quantities and combinations are really needed for daily work? All these questions can now be answered in the context of ongoing real-time inventory.